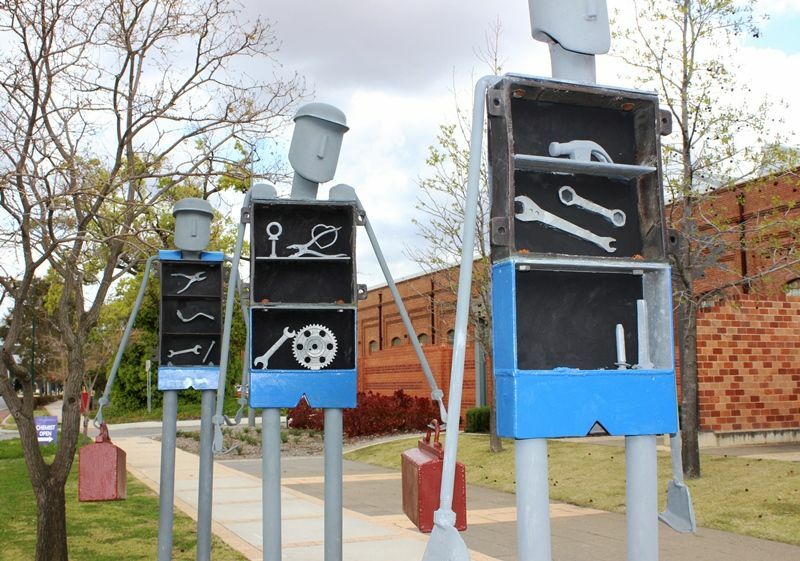 The Midland Railway Workshops Sculptures pay tribute to those who have a connection with the Midland Railway Workshops. The Midland Redevelopment Authority (MRA) was appointed custodians of the Midland Railway Workshops by the State Government in 1999 and it was the role of the authority to fund and support major permanent public art works in the area. In early 2000, Kath Wheatley was commissioned to create a series of quirky long-legged sculptures which paid tribute to the strong connection between the workers, family and friends of the Midland Railway Workshop. The sculptures are located at Yelverton Drive, The Crescent and The Great Eastern Highway in the vicinity of the Railways Workshop. In April 1993, the Richard Court Liberal State Government announced that the Workshops would be eventually closed. Despite a number of protests and rallies to save the Workshops, the call to save the Workshops was completely ignored by the Government. On Friday 4 March 1994, the remaining workers assembled at the traditional Workshops meeting area, the flagpole. Longtime employee and timekeeper, Kevin Mountain was given the task of lowering the Australian flag for the last time ending not only his career but 90 years of Western Australian railway history.